Mubychem Group, established in 1976, is the pioneer manufacturer of Magnesium Stearate, Pharmaceutical, Fragrance & Flavor chemicals in India. Mubychem Group has several manufacturing facilities spread across Gujarat and Mumbai India and world wide contacts and toll manufacturers. We are exporting globally to countries like USA, Europe, UAE, South Africa, Tanzania, Kenya, Egypt, Nigeria, Uganda, Turkey, Mexico, Brazil, Chile, Argentina, Dubai, Indonesia etc. Magnesium stearate is a mixture of magnesium salts of different fatty acids consisting mainly of stearic (octadecanoic) acid [(C17H35COO)2Mg] and palmitic (hexadecanoic) acid [(C15H31COO)2 Mg] with minor proportions of other fatty acids. It contains not less than 4.0 per cent and not more than 5.0 per cent of Mg, calculated with reference to the dried substance. The fatty acid fraction contains not less than 40.0 per cent of stearic acid and the sum of stearic acid and palmitic acid is not less than 90.0 per cent. 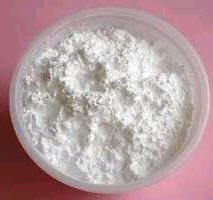 A white or almost white, very fine, light powder, greasy to the touch, practically insoluble in water and in ethanol. Second identification A, B, D.
A. The residue obtained in the preparation of solution S (see Tests) has a freezing point not lower than 53C. B. The acid value of the fatty acids (2.5.1) is 195 to 210, determined on 0.200 g of the residue obtained in the preparation of solution S dissolved in 25 ml of the prescribed mixture of solvents. C. Examine the chromatograms obtained in the test for fatty acid composition. The retention times of the principal peaks in the chromatogram obtained with the test solution are approximately the same as those of the principal peaks in the chromatogram obtained with the reference solution. D. 1 ml of solution S gives the reaction of magnesium. To 5.0 g Magnesium stearate add 50 ml of peroxide-free ether, 20 ml of dilute nitric acid and 20 ml of distilled water and heat under a reflux condenser until dissolution is complete. Allow to cool. In a separating funnel, separate the aqueous layer and shake the ether layer with 2 quantities, each of 4 ml, of distilled water. Combine the aqueous layers, wash with 15 ml of peroxide-free ether and dilute to 50 ml with distilled water R (solution S). Evaporate the organic layer to dryness and dry the residue at 100-105°C. Keep the residue for identification tests A and B. To 1.0 g Magnesium stearate add 20 ml of carbon dioxide-free water R and boil for 1 min with continuous stirring. Cool and filter. To 10 ml of the filtrate add 0.05 ml of bromothymol blue solution. Not more than 0.5 ml of 0.01 M hydrochloric acid or 0.01 M sodium hydroxide is required to change the colour of the indicator. 0.5 ml of solution S diluted to 15 ml with water R complies with the limit test for chlorides (0.1 per cent). 0.3 ml of solution S diluted to 15 ml with distilled water complies with the limit test for sulphates (0.5 per cent). Not more than 3.0 ppm of Cd, determined by atomic absorption spectrometry. Not more than 10.0 ppm of Pb, determined by atomic absorption spectrometry. Not more than 5.0 ppm of Ni, determined by atomic absorption. Not more than 6.0 per cent, determined on 1.000 g by drying in an oven at 105C. Total viable aerobic count not more than 103 micro-organisms per gram, determined by plate count. It complies with the test for Escherichia coli. Magnesium Stearate is a compound of magnesium with a mixture of solid organic acids, and consists chiefly of variable proportions of magnesium stearate and magnesium palmitate. The fatty acids are derived from edible sources. It contains not less than 4.0 percent and not more than 5.0 percent of Mg, calculated on the dried basis. A: Mix 5.0 g Magnesium stearate with 50 mL of peroxide-free ether, 20 mL of diluted nitric acid, and 20 mL of water in a round-bottom flask. Connect the flask to a reflux condenser, and reflux until dissolution is complete. Allow to cool, and transfer the contents of the flask to a separator. Shake, allow the layers to separate, and transfer the aqueous layer to a flask. Extract the ether layer with two 4-mL portions of water, and add these aqueous extracts to the main aqueous extract. Wash the aqueous extract with 15 mL of peroxide-free ether, transfer the aqueous extract to a 50-mL volumetric flask, dilute with water to volume, and mix. Retain this solution for the Limit of chloride and Limit of sulfate tests. This solution responds to the test for Magnesium. B: The retention times of the peaks corresponding to stearic acid and palmitic acid in the chromatogram of the Test solution correspond to those in the chromatogram of the System suitability solution, as obtained in the Relative content of stearic acid and palmitic acid test. Microbial limits— The total aerobic microbial count does not exceed 1000 cfu per g, the total combined molds and yeasts count does not exceed 500 cfu per g, and it meets the requirements of the tests for absence of Salmonella species and Escherichia coli. Acidity or alkalinity— Transfer 1.0 g Magnesium stearate to a 100-mL beaker, add 20 mL of carbon dioxide-free water, boil on a steam bath for 1 minute with continuous shaking, cool, and filter. Add 0.05 mL of bromothymol blue TS to 10 mL of the filtrate: not more than 0.05 mL of 0.1 N hydrochloric acid or 0.1 N sodium hydroxide is required to change the color of the indicator. Loss on drying— Dry it at 105 to constant weight: it loses not more than 6.0% of its weight. Specific surface area— [NOTE—In cases where there are no functionality-related concerns regarding the specific surface area of this article, this test may be omitted.] Where the labeling states the specific surface area, determine the specific surface area value as directed in the chapter in the P/P0 range of 0.05 to 0.15, and using out gassing conditions of 2 hours at 40 . If the plot deviates from linearity for P/P0 values of 0.05 to 0.15, then a suitable range of P/P0 values should be validated for linearity. In this case, it is necessary to state the range of validated P/P0 values, the increment of the P/P0 values, and the out gassing conditions employed. Limit of chloride— A 10.0-mL portion of the aqueous solution obtained in Identification test A shows no more chloride than corresponds to 1.4 mL of 0.020 N hydrochloric acid (0.1%). Limit of sulfate— A 3.0 mL portion of the aqueous solution obtained in Identification test A shows no more sulfate than corresponds to 3.0 mL of 0.020 N sulfuric acid (1.0%). Lead— Ignite 0.50 g Magnesium stearate in a silica crucible in a muffle furnace at 475 to 500 for 15 to 20 minutes. Cool, add 3 drops of nitric acid, evaporate over a low flame to dryness, and again ignite at 475 to 500 for 30 minutes. Dissolve the residue in 1 mL of a mixture of equal parts by volume of nitric acid and water, and wash into a separator with several successive portions of water. Add 3 mL of Ammonium Citrate Solution and 0.5 mL of Hydroxylamine Hydrochloride Solution, and render alkaline to phenol red TS with ammonium hydroxide. Add 10 mL of Potassium Cyanide Solution. Immediately extract the solution with successive 5-mL portions of Dithizone Extraction Solution, draining off each extract into another separator, until the last portion of dithizone solution retains its green color. Shake the combined extracts for 30 seconds with 20 mL of 0.2 N nitric acid, and discard the chloroform layer. Add to the acid solution 4.0 mL of Ammonia-Cyanide Solution and 2 drops of Hydroxylamine Hydrochloride Solution. Add 10.0 mL of Standard Dithizone Solution, and shake the mixture for 30 seconds. Pass the chloroform layer through an acid-washed filter paper into a color-comparison tube, and compare the color with that of a standard solution prepared as follows. To 20 mL of 0.2 N nitric acid add 5 ?g of lead, 4 mL of Ammonia-Cyanide Solution, and 2 drops of Hydroxylamine Hydrochloride Solution, and shake with 10.0 mL of Standard Dithizone Solution for 30 seconds. Pass through an acid-washed filter paper into a color comparison tube. The color of the sample solution does not exceed that of the control (0.001%). Relative content of stearic acid and palmitic acid— The stearate peak comprises not less than 40%; and the sum of the stearate and palmitate peaks is not less than 90% of the total area of all fatty acid ester peaks in the chromatogram. Magnesium Stearate occurs as a fine, white, bulky powder that is unctuous and free from grittiness. It is a compound of magnesium with a mixture of solid organic acids obtained from edible sources and consists chiefly of variable proportions of Magnesium Stearate and magnesium palmitate. It is insoluble in water, in alcohol, and in ether. Function: Ant caking agent; binder; emulsifier. A. Heat 1 g of Magnesium stearate with a mixture of 25 mL of water and 5 mL of hydrochloric acid. Liberated fatty acids float as an oily layer on the surface of the liquid. The water layer gives positive tests for Magnesium. Assay: Not less than 6.8% and not more than 8.3% of MgO. Loss on Drying: Not more than 4.0%.